Athens is Mediterranean – it saves most of its energy and its excitement until after the sun sets. That’s when it shifts up a gear and puts on its party clothes. Come join the locals in popular nightspots across town as they relax, unwind and spend time with friends, drink and music. One thing is sure: Athens knows how to party! 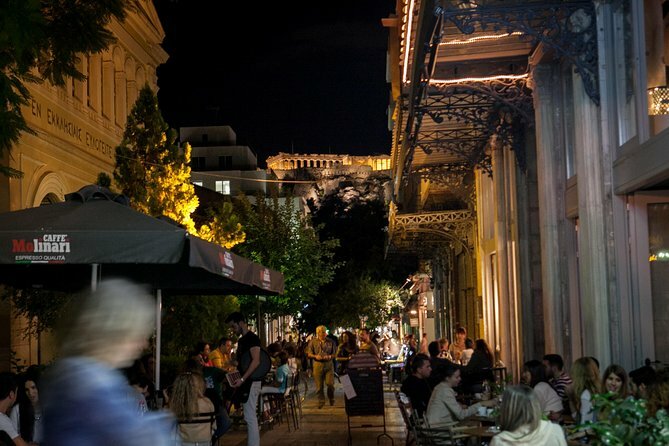 If you're visiting the city, going out at night is a must -and you should experience it not as a tourist, but as a true Athenian. The city is offering an amazing array of music styles and entertainment genres by night; there’s something for everyone here. But what's really unique about the Athenian nightlife is the friendly and boisterous character of the Greeks, making Athens a good-hearted, energetic city. Your evening begins with a visit to a local neighborhood bar, to give you a feel of the everyday laid-back night scene that Athens has to offer. Then it’s off to the hip downtown bars, celebrated mixologists and a see-and-be-seen philosophy in the trendier spots. Your guide, an open-hearted, outgoing Athenian who stays up longer at night than during the day, will help you find the perfect drinks at the coolest venues and give you any help you need in interpreting local customs. You’ll also do what everyone does in Athens when they drink – you’ll eat a little, because food and drink go together, and because it’s a great opportunity to try some Greek meze (small dishes that go with drinks). By the end of the evening, you’ll have seen a whole new side of the city and enjoyed it like the city’s residents do, with a bit of recklessness and a warm feeling towards these spaces that really let them express themselves.